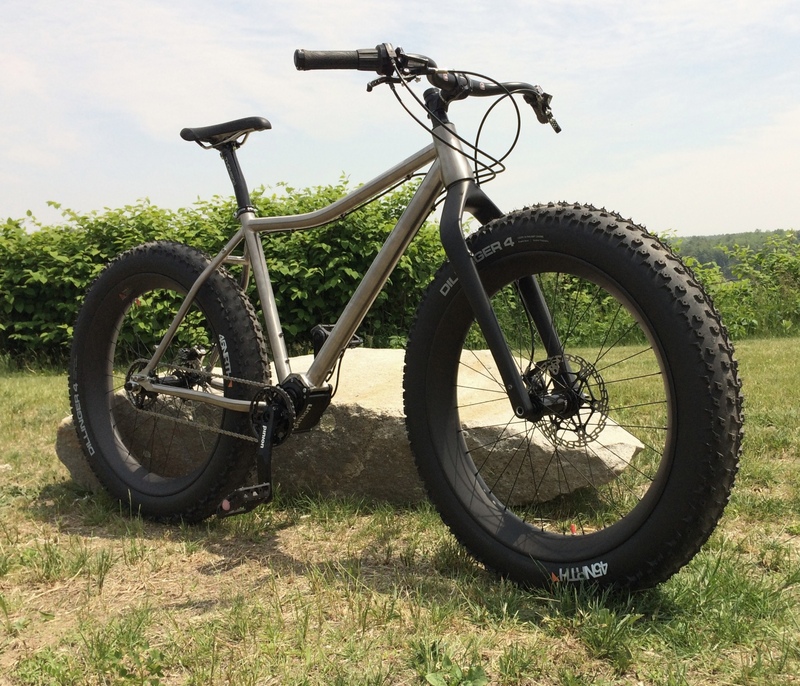 The Ti O’Beast was the obvious choice for our first gearbox equipped fatbike. Having previously built Ti 420’s gave us a leg up with an already proven titanium mounting plate, allowing us to work with our builders and integrate the mount into our current Ti O’Beast frame. 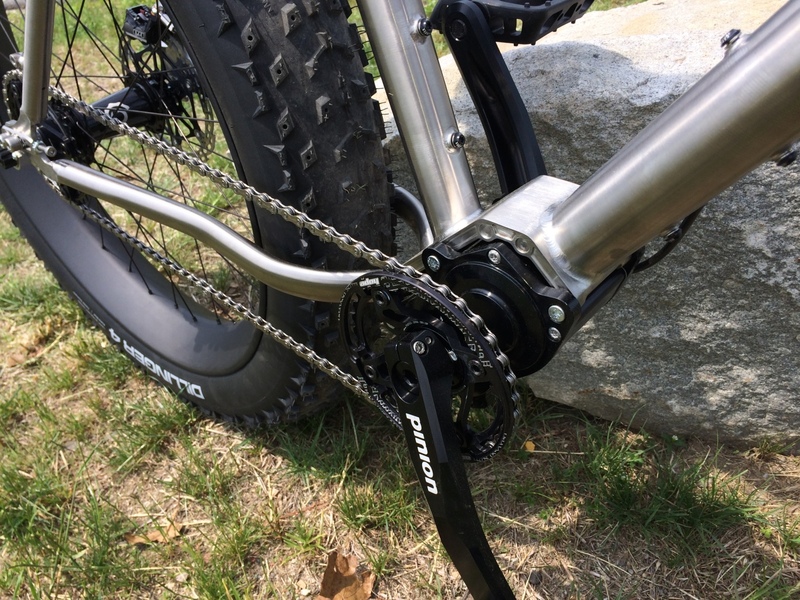 For our first Pinion equipped fatbike we chose the P1.9XR transmission. The P1.9XR is the lightest transmission Pinion produces at 2200grams and features 9 real gears and a 568% overall gear ratio. 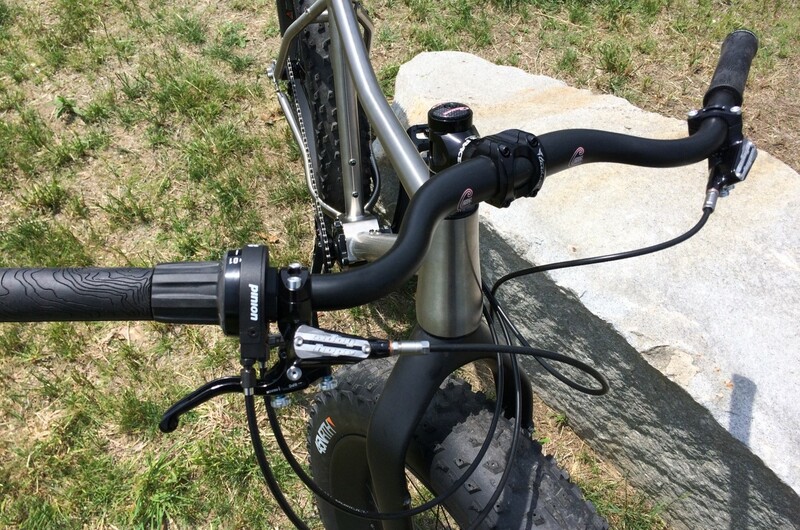 More than enough to range to tackle the toughest New England singletrack. Pinion also offers a narrow ratio 9 speed, a 12 speed, and even an 18 speed version, If you find you need to make some tweaks as you head into winter you can always play with chainring / cog combinations to find the sweet spot for your riding style. This custom O’Beast was built for a customer with all the latest Carver Bikes parts including our new Carbon Fatbike rims, Carbo’Beast tapered fork and the very popular Carver MyTi Carbon handlebar. 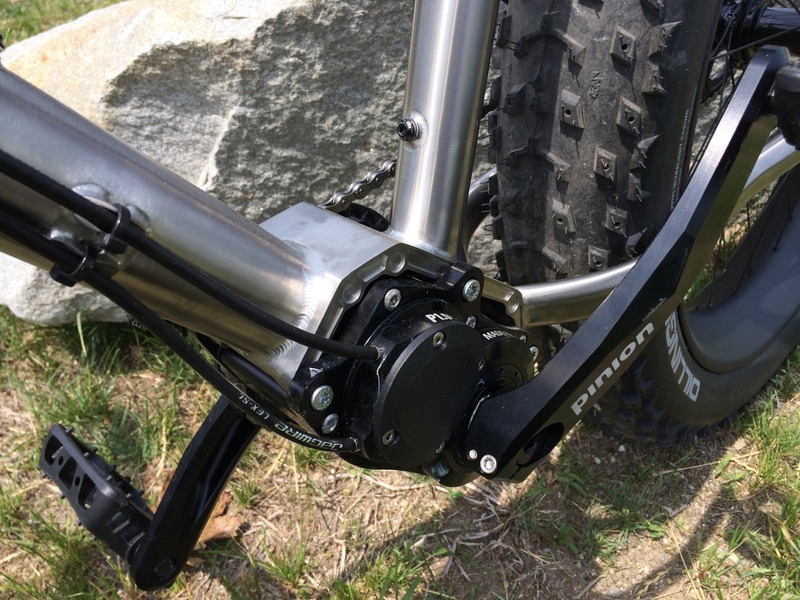 Using a Pinion transmission mounting plate gives us plenty of room to create chainstay clearance for the Dillinger 4 tires used in this build. 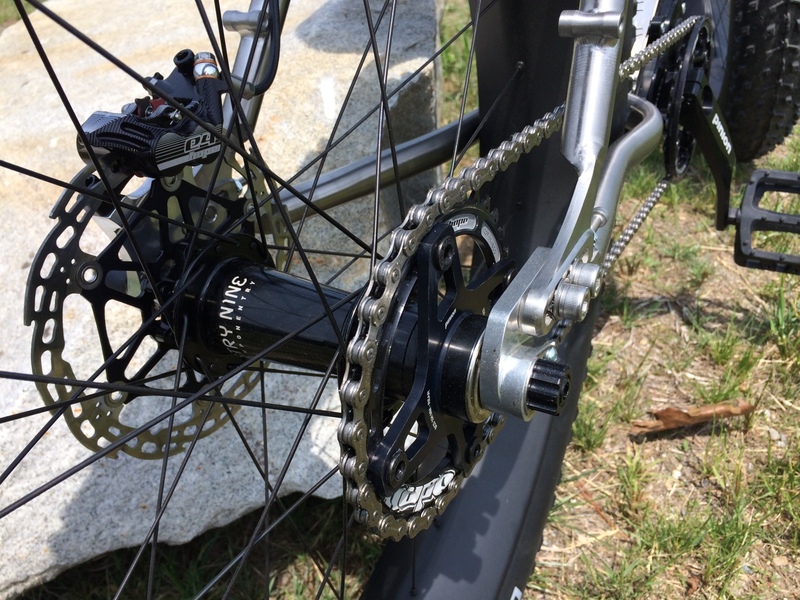 The chainline also worked out perfectly thanks to the new offset chainring spider and with a fixed chainline you will never have to worry about the chain catching the tire. 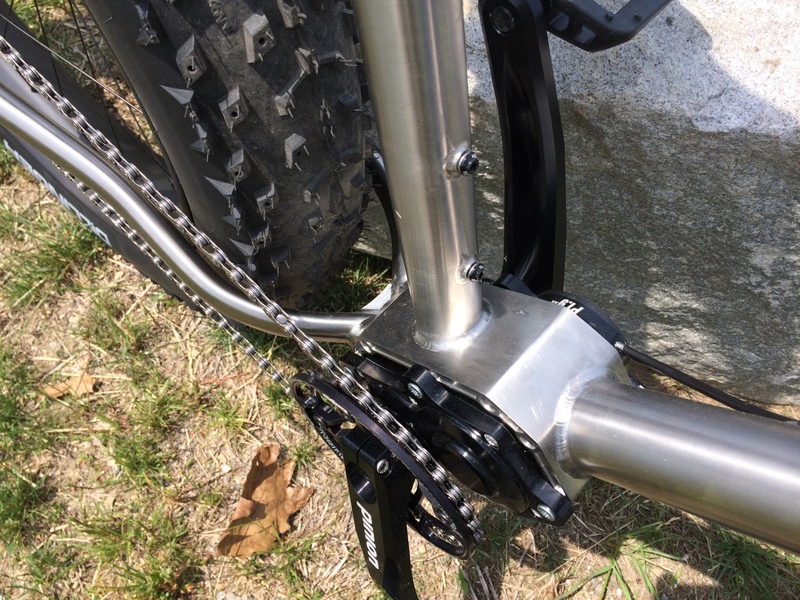 One of the coolest aspects of Pinion equipped bikes is that they use a simple single speed rear wheel. That means that you can use a single bike with a huge variety of different wheelsets. From Fat Bike to 700 x 23 road bike in the time it takes to do a Tour de France wheel swap. A true Swiss Army bike. Oh dear Lord! What a bike! 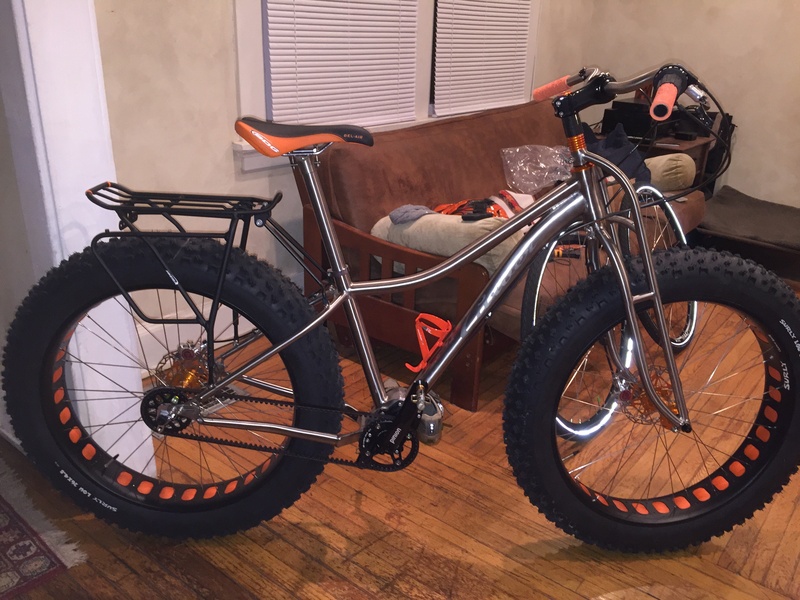 Have you built a version of this bike with a belt drive? Kevin, as it is in the picture I have $6250 invested, $7000 including the set of ‘thin’ wheels, as the primary use is commuting. Those costs are based on my doing the wheelbuilding work, and scavenging some of the parts and building the bike myself. RJ, HAHA! That truss fork was also made by Davis’ team, I spec’d that because the primary use for this bike is commuting, in all weathers. Corrosion resistance and ruggedness are primary requirements, and I also just loved the aesthetic of that design. Turns out (pun!) that the fork is quite compliant too, even more so than the early generation Carver carbon fork I had on my Moonlander prior to building this rig. Nice! I really like the belt drive, near zero maintenance even in the nasty winter weather. I decided on the Pinion so that I can do easy/fast wheel swaps, to accommodate weather changes, not so easy with a hub gear (which I had on my previous commuter). I have a wheelset with 100mm rims shod with Surly Lou’s, and the other set has 24mm rims currently shod with Schwalbe Ice Spiker Pro tires. In the summer the ‘skinny’ wheels wear Schwalbe Marathon tires with Slime inner tubes, for high mileage and puncture immunity. I now have over 2,200 miles on my O’Beast, and it is just awesome! Sign up for Carver updates.